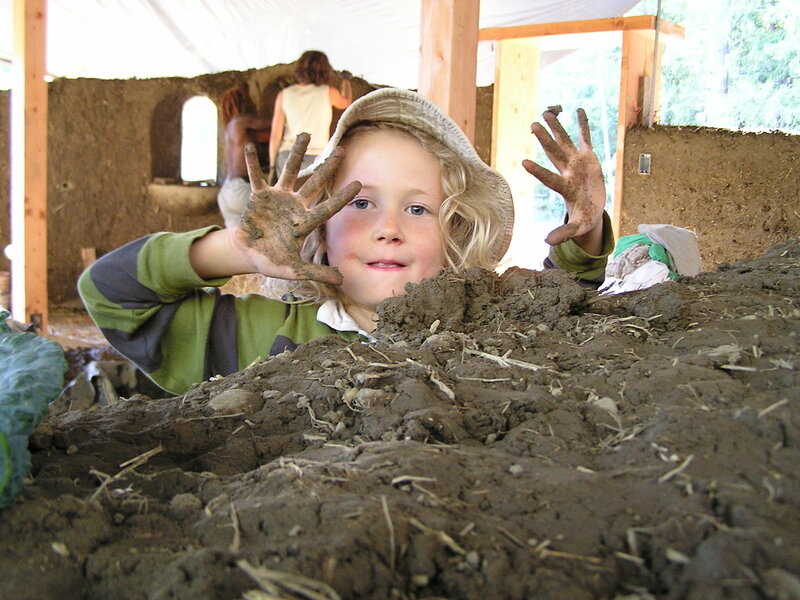 We are heading into our third season of winter in our straw bale house. 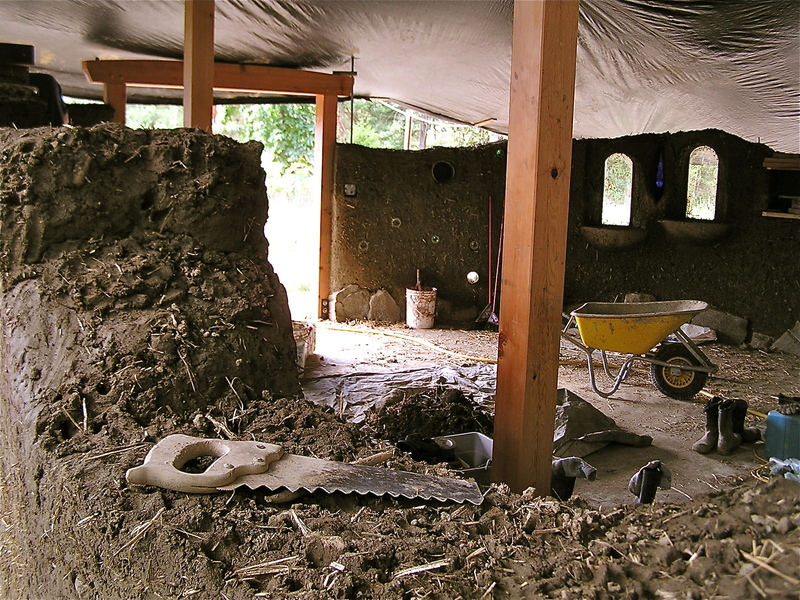 Hard to believe really – I so clearly remember the feeling that the house would just never be done – but there you have it, two years later we are really beginning to see the way the design and materials of the house perform through the seasons. Last winter was a relatively mild winter in an already mild climate zone, and the winter before we didn’t really move in fully until January, so getting a sense of how much wood we might burn and how much our heating/electrical costs would be throughout the winter months has only just begun to be obvious. 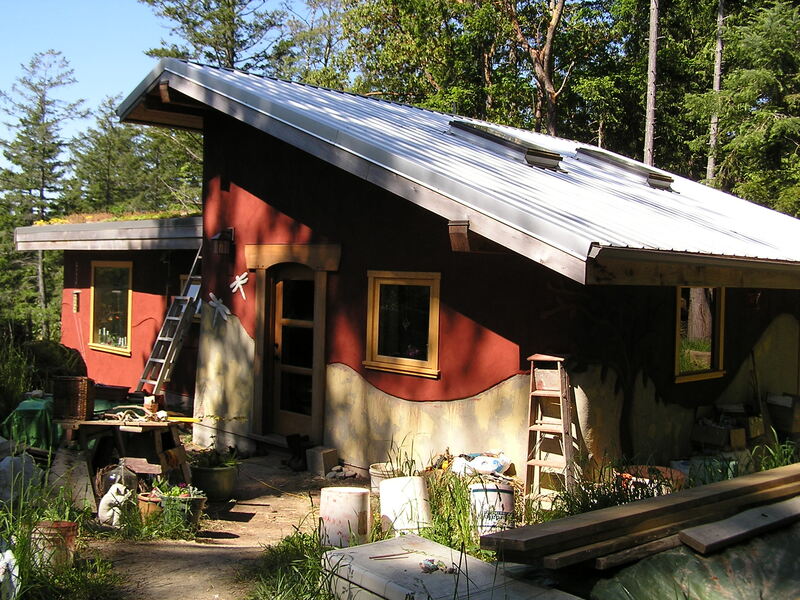 Our three forms of heat are the wood stove, hydronic in-floor heating, and passive solar orientation. The winter sun arches across the sky, sending it’s light and heat into our east and south windows (when it is out!) staying entirely above the top of the trees of the ridge across the valley of which we face. At certain times of the spring and fall, the light of the sun bounces off the pond below us which lights up our ceiling with ripply light- an unplanned bonus! 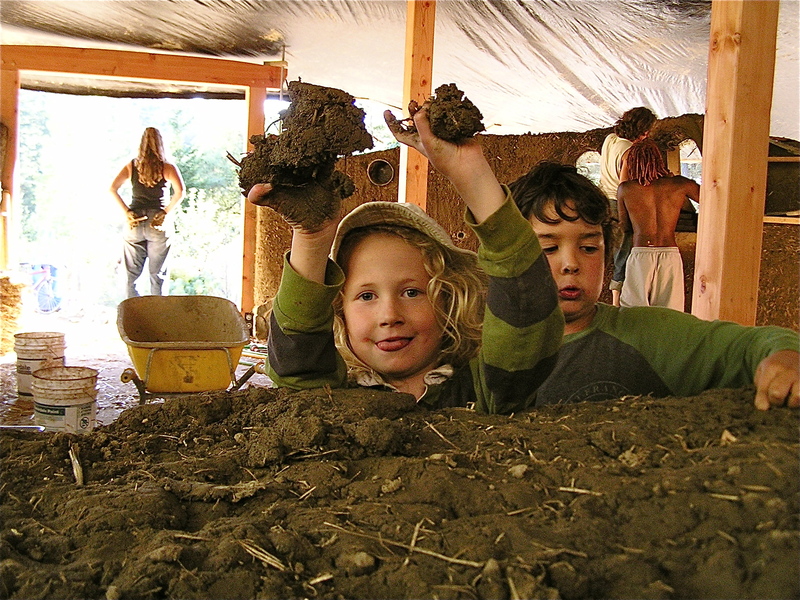 We have an earthen floor in the front room, which noticeably absorbs the warmth and retains it into the evening. 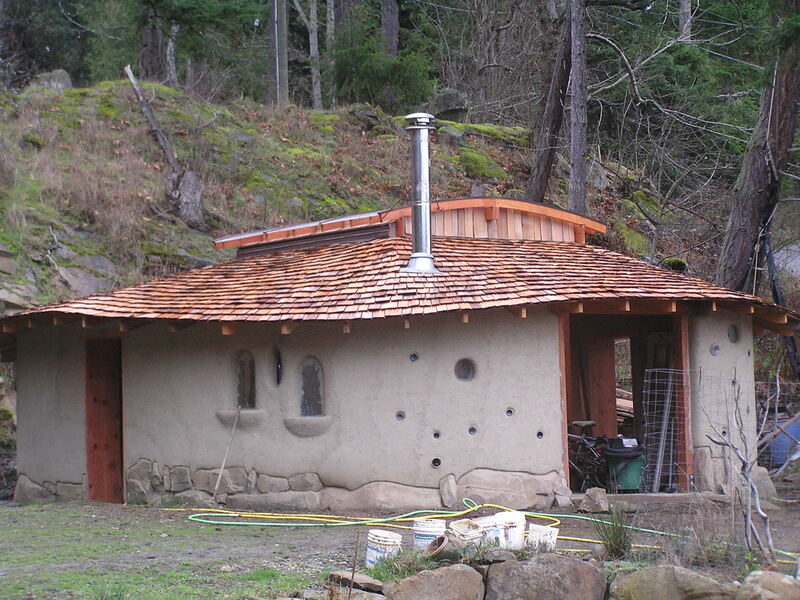 The wood stove sits on a two foot tall stone hearth and is backed by a short cob wall, both of which absorb sun heat as well as stove heat. 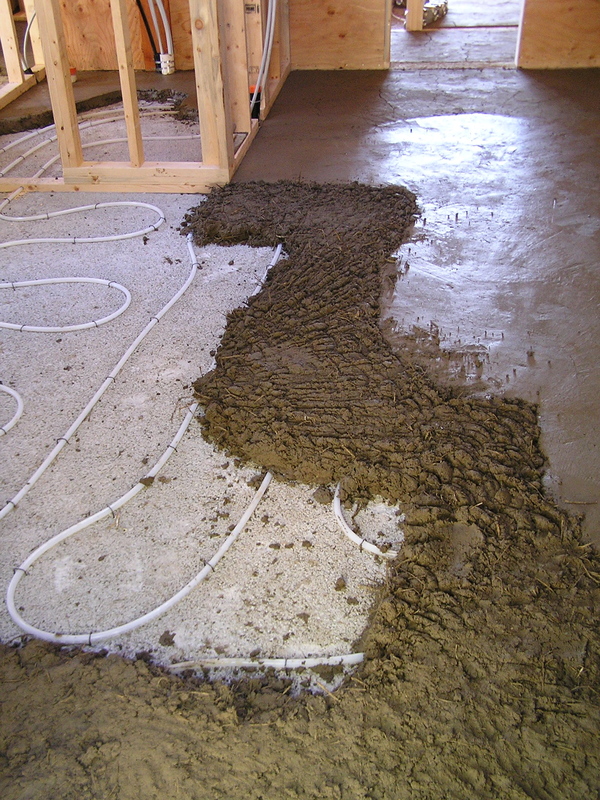 Our in-floor heating is divided into two zones, one for the bathroom and north side of the house, and one which circulates the front south room. They are set to come on if the temperatures of the rooms drop below 19 degrees celsius. The front room heating has never come on, and the backroom zone clicks on early in the mornings of the coldest days of winter. 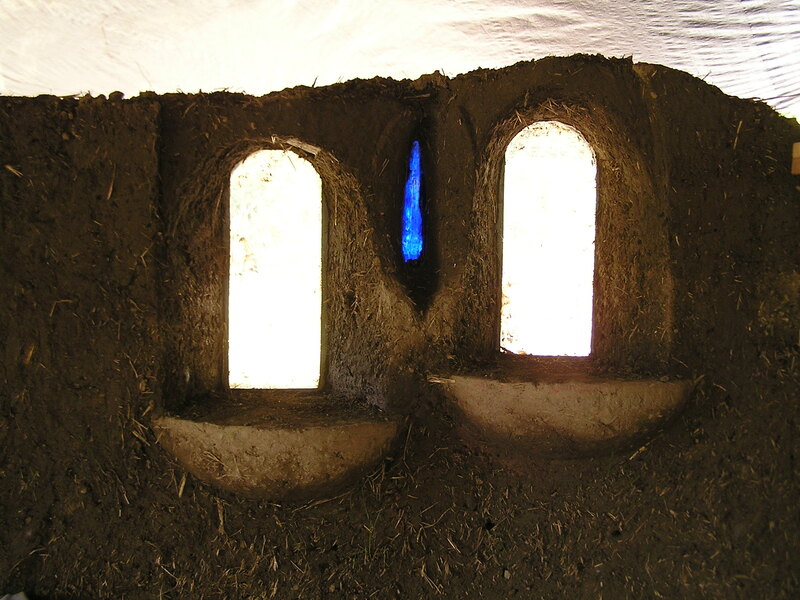 The tubes are embedded under 3 inches of cob, which then also retains heat for longer. 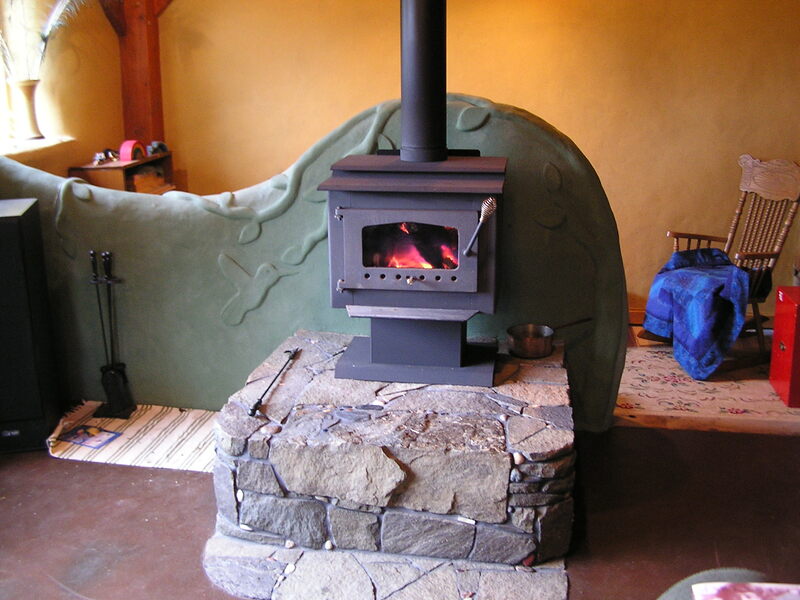 We primarily rely on the wood stove for immediate heat. This year we lit our first fire on November 20th, and mostly because we were nostalgic for that first cozy fire. We kept the fire going for about an hour, and then we were too hot. We have found that we really only need to light a fire around four or five o’clock, depending on the temperature outside, and let it die down around nine, otherwise it gets up to 25 degrees! We have been having a cold spell right now, where temperatures fall towards -2 or -3 degrees at night (oh my! ), and then we might light a fire at three in the afternoon. Our evening fires keep the house sitting at 20 until late the next day. Last year, this translated into our using less than half a cord of fire wood in the whole season. We have an older style stove that doesn’t have any of the newer reburning/efficient innovations, and our space is 920 interior square feet. 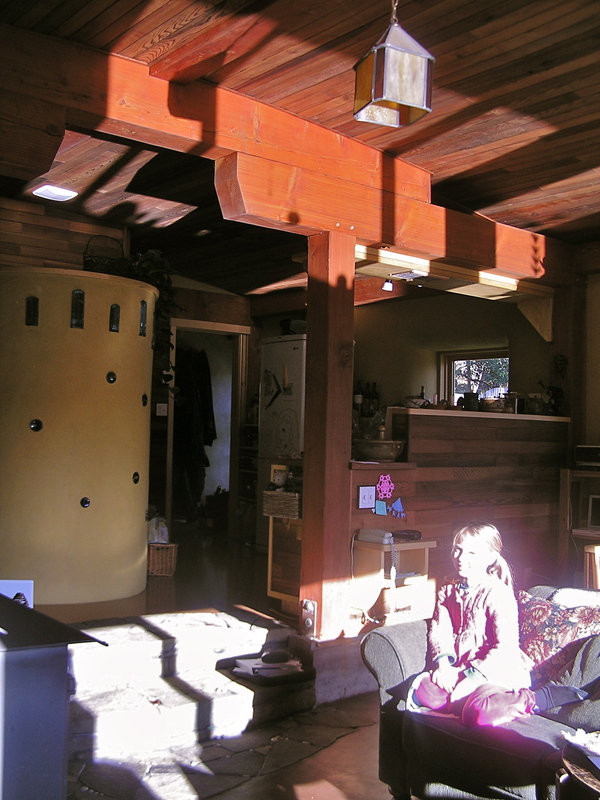 The southerly exposed room of the house is lowered by two steps, (which is where the wood stove is) and so the heat tends to naturally move towards the north side of the house as it attempts to travel upwards. If we leave one window open in the loft of the back room, the heat is pulled even more into that space. 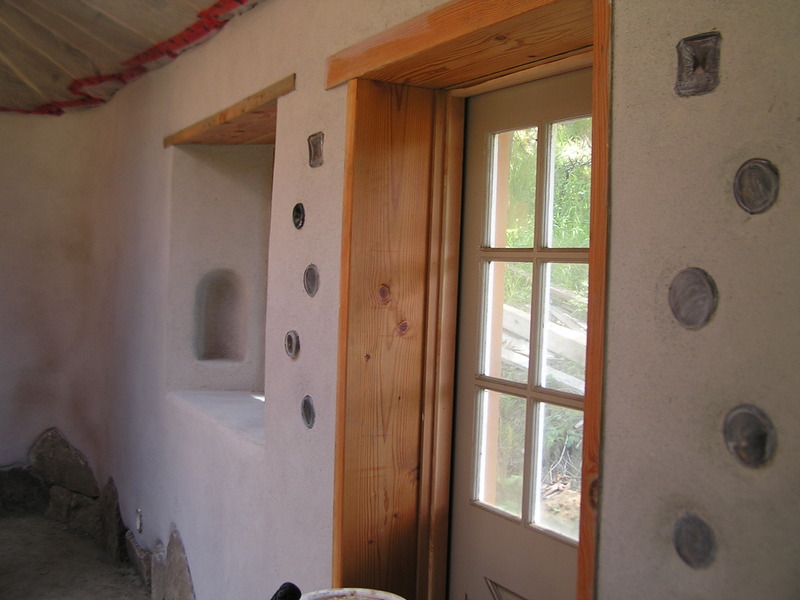 Another design feature of the walls themselves are the wrap- around construction – meaning that the bales are continuously wrapped around the outside of the timber frame, leaving no thermal breaks except where there are doors and windows. 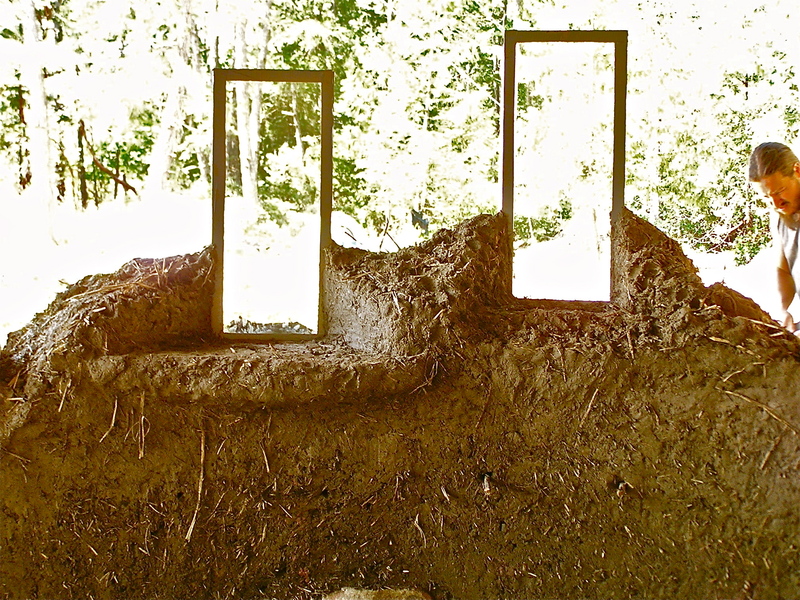 We used double pane thermal glass with argon gas and a low-E squared coating. I love the heat that a wood stove gives, but I am not excited about the amount of wood and trees that need to be burned. It is not entirely a “clean” way of heating. Eventually we will have three wood stoves on our property – this one, one in the work shop, and one in our addition to this house. 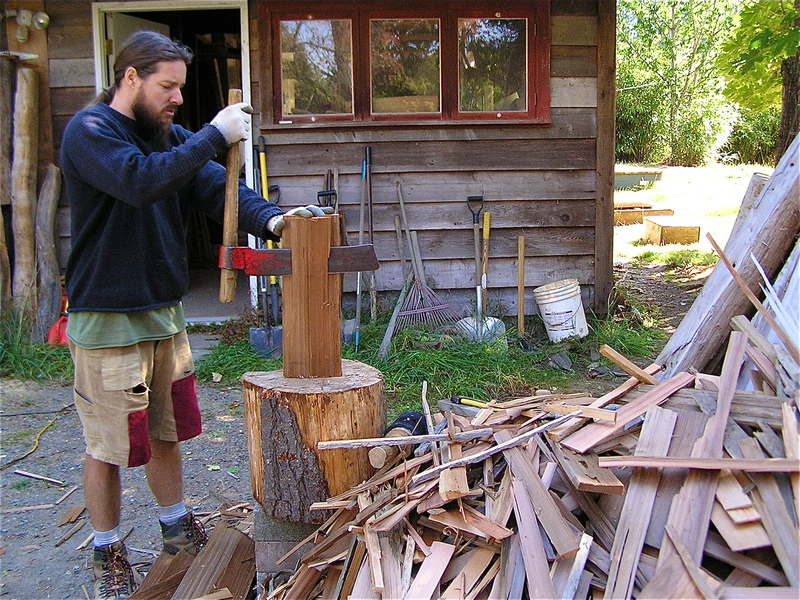 Luckily, Colin’s business of crafting furniture from salvaged red cedar means that we have a lot of great kindling and fire wood just from his waste. I am comforted to know that we can potentially heat our spaces for years on just a few dead or cleared trees. We took out a few trees when building the house, and haven’t even started using them. This fall, I chopped almost two cords of wood from those trees, which will potentially be three years of wood. The less wood we go through the better – we even find that turning on the stove to make dinner warms the space efficiently some nights. Certainly, if we have friends over in the evening, lighting a fire usually leads to opening some windows. Straw bales reportedly have an R value of 30-60. 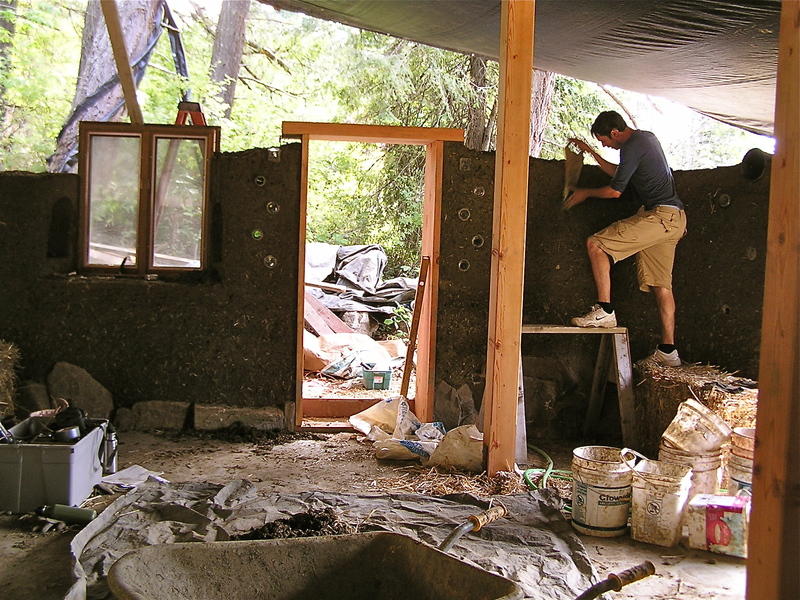 The building code requires that insulation needs to have an R value of 20 in walls. We have experienced this amazingly efficient quality of insulation, in the winter and in the summer, when the inside of the house is cool and refreshing on hot days. 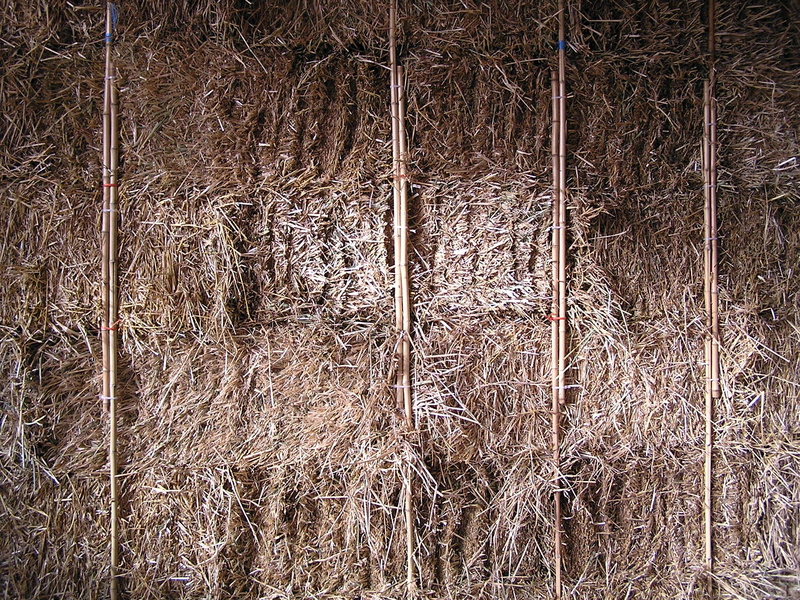 With a 3 foot overhang of the roof blocking out the sun’s light in summer and the rain in the winter, I am ever more convinced that straw bales are a fantastic way of providing natural temperature control in any climate. 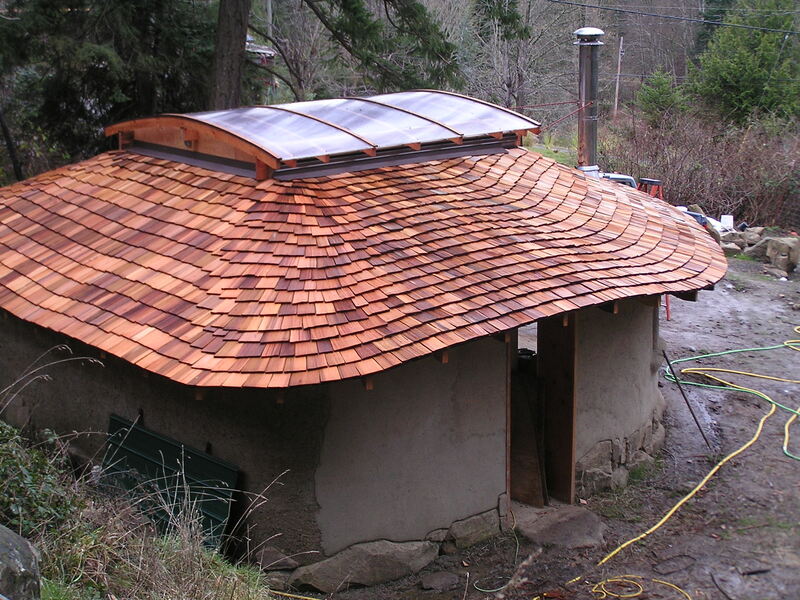 Being a splitter of cedar by trade, Colin naturally decided to split all his own shakes for the roof of his new workshop by hand. 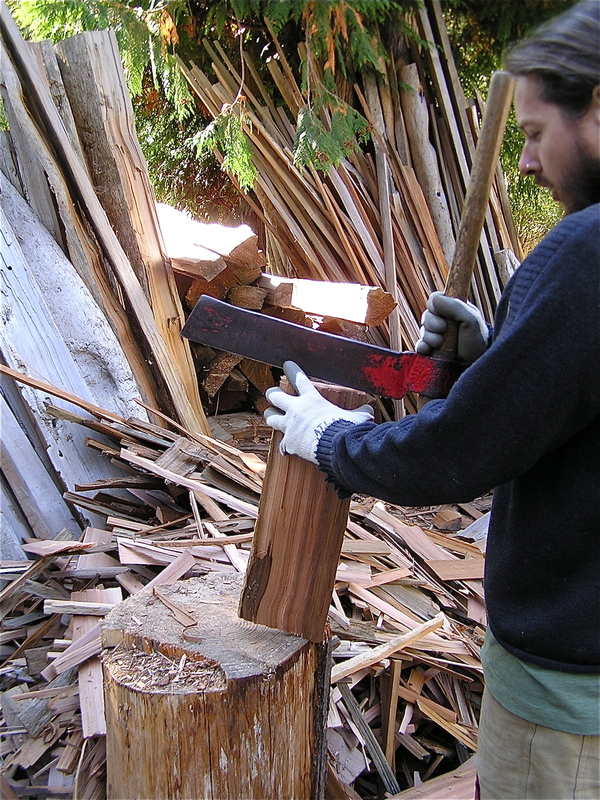 Having many piles of cedar already collected and in need of being moved out of his old working location gave Colin a good start at the job of splitting approximately 600 square feet of coverage, or what he estimated to be 6 squares of shakes. 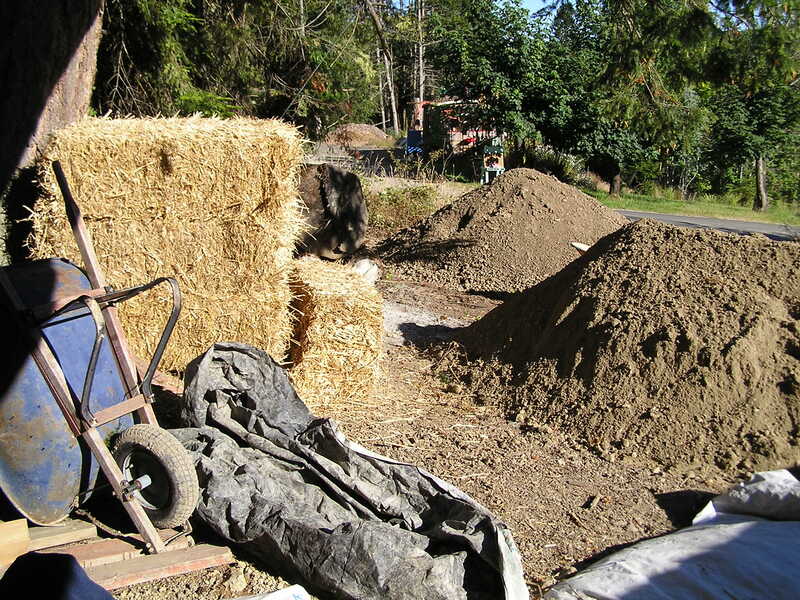 A square is made up of 4 bundles of shakes covering 100 square feet (each bundle covers approx. 25sq.ft. depending on length of shake and row coverage). 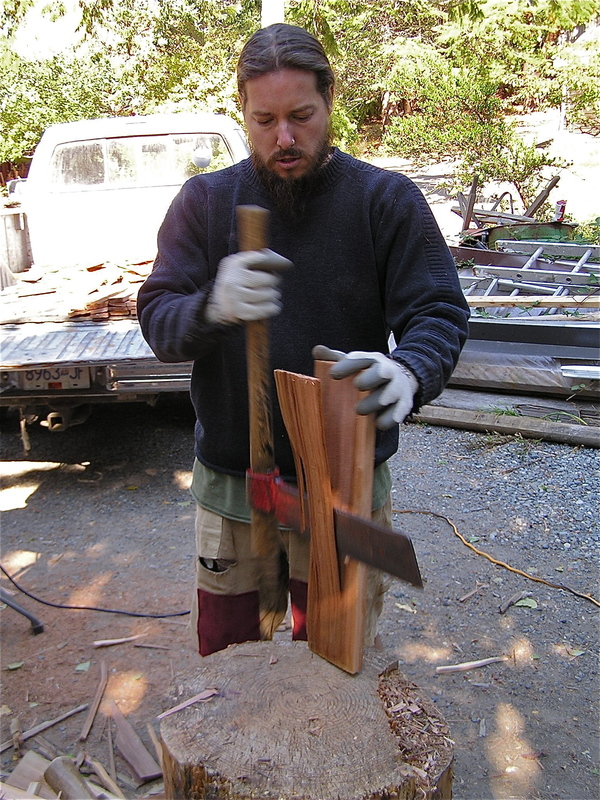 Using a froe and mallet, Colin split and shaped the shakes out of 18″ bolts of cedar, using the best of the shakes for the roof and saving the less than ideal (wavy, thin, less tapered, or too narrow) for a future wall project. 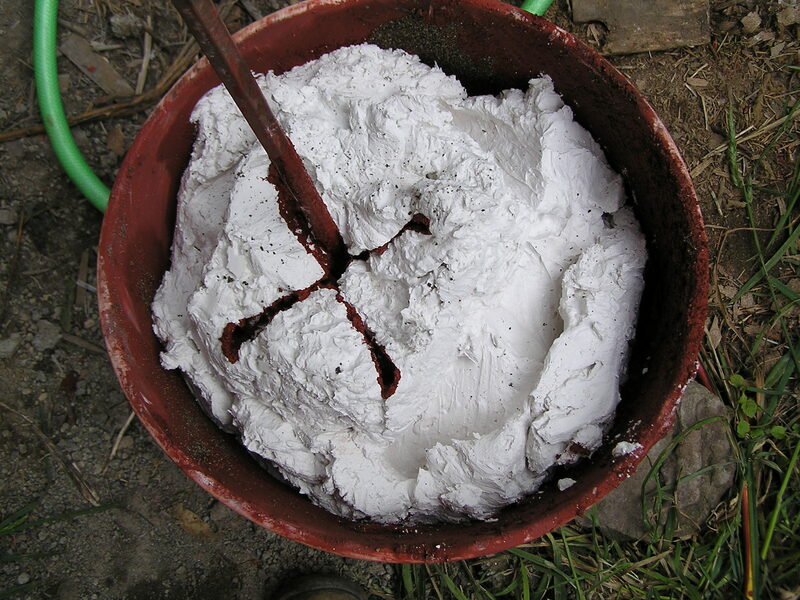 Shakes are split by placing the froe across the grain on one end of the bolt, about 3/4″ from the edge, then hitting the froe with the mallet and peeling off the shake. It should taper somewhat (shakes can be 24″ or 18″ long, usually the longer the better for coverage and tapering) and then you flip the bolt over and repeat the same action, flipping the bolt after splitting each shake. It took a surprisingly long time to split the estimated amount needed, mostly because of the amount of less than perfect shakes that he was getting from the bolts he was using (of which much was old grapestakes, and other pieces of cedar that were not as usable in longer lengths anymore, as the cedar he salvages is not collected for shakes, but in longer bolts usable for furniture, gates and fencing). Colin chose 18″ shakes partly because of the wood he had available and partly because of the curves and roundness of the roof on his shop. He layered the shakes with an overlap of 7.5″ each row. As the rows are applied it is important to offset the gaps between shakes from row to row. What this means essentially is that the space between shakes never lines up directly with the gap in the row below, and better yet not for 3 rows. 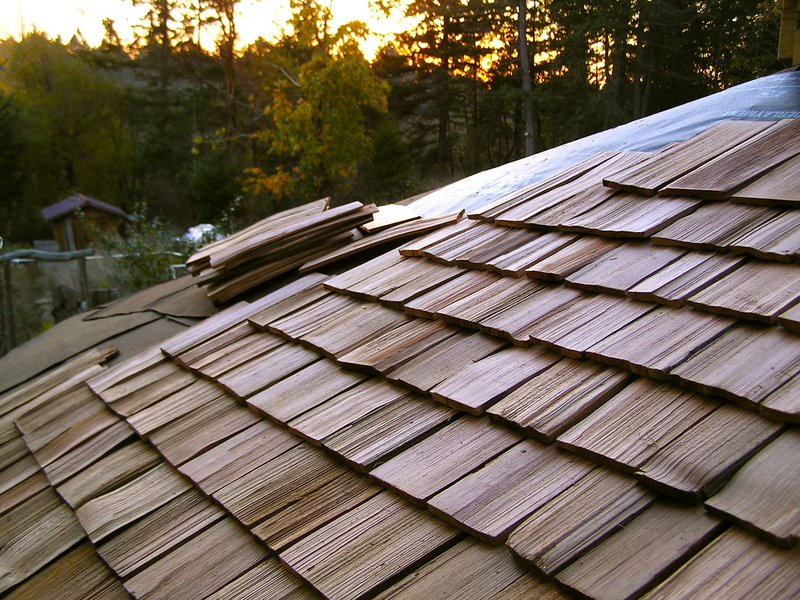 The straight grains of cedar and the overlapping shakes encourages efficient water run-off, while the gaps allow for evaporation and quick drying time. 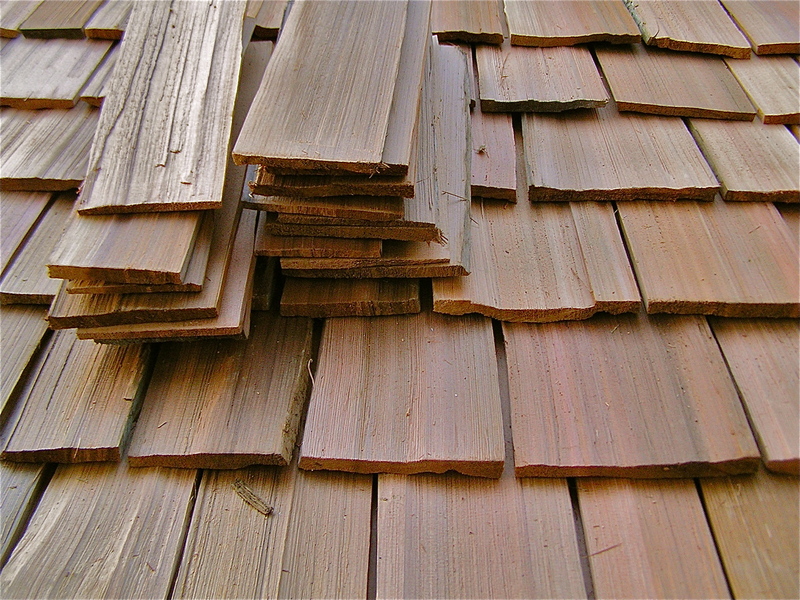 Cedar shake roofs have a life span of 50 years (though some have been known to last upwards of 80yrs). 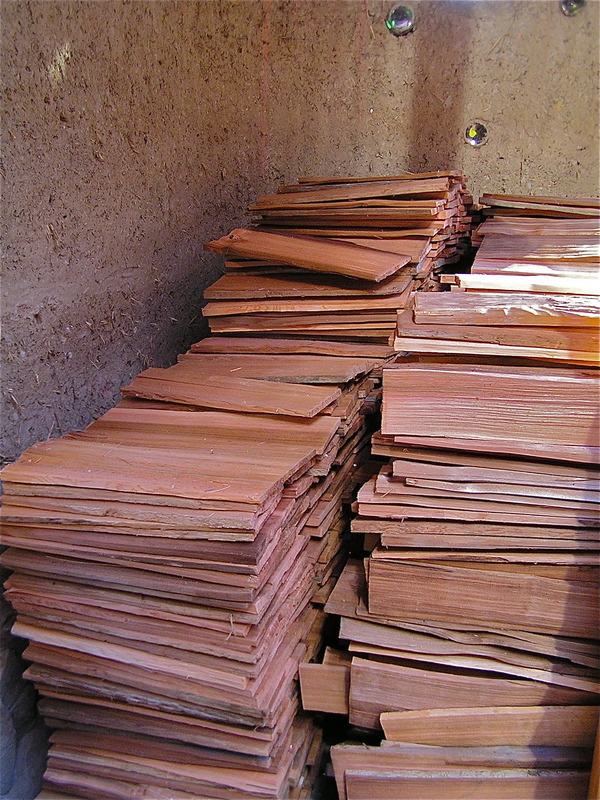 Cedar shingles differ from shakes in that they are taper sawn, thinner, and usually are rated only for 25yrs. Cedar has excellent natural oils present in it’s wood that makes it rot resistant in it’s naturally wet climate. 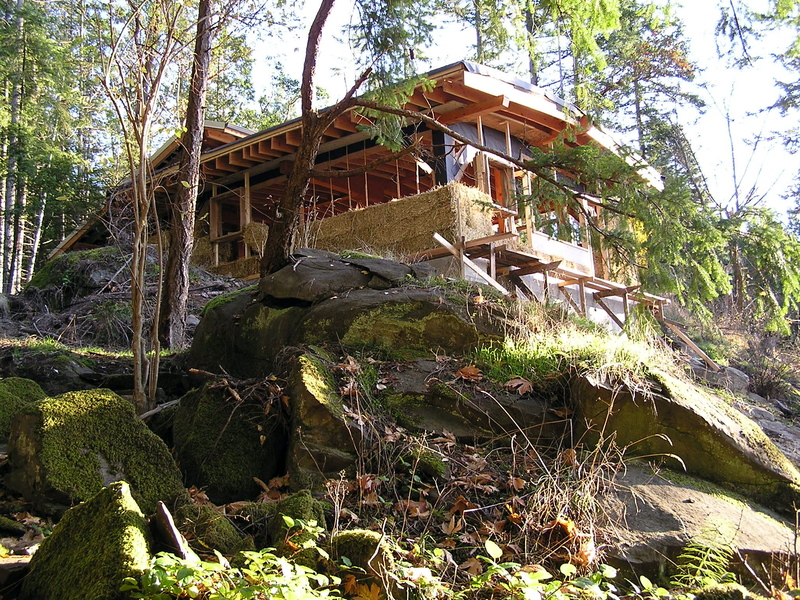 Much of the northern pacific coastline, rimmed and abundant in fat old growth logs, offers ideal shake block opportunities with wide planks and tight grains. Most shakes are collected from downed red cedars near logging clear cuts or trees not long enough to be worth milling into lumber. 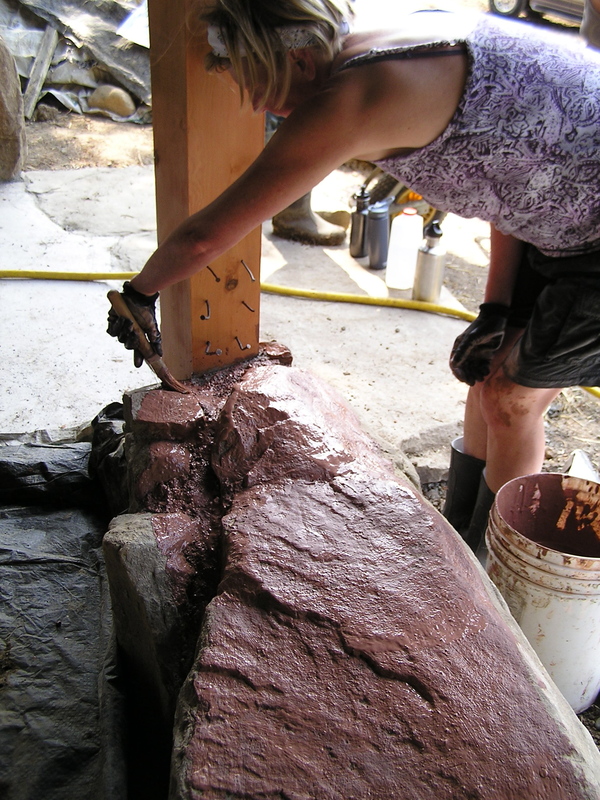 Here we have salvaged what we can find on the beaches and then applied the best of our skills to producing by hand the beautiful and functional flow of cedar shakes. 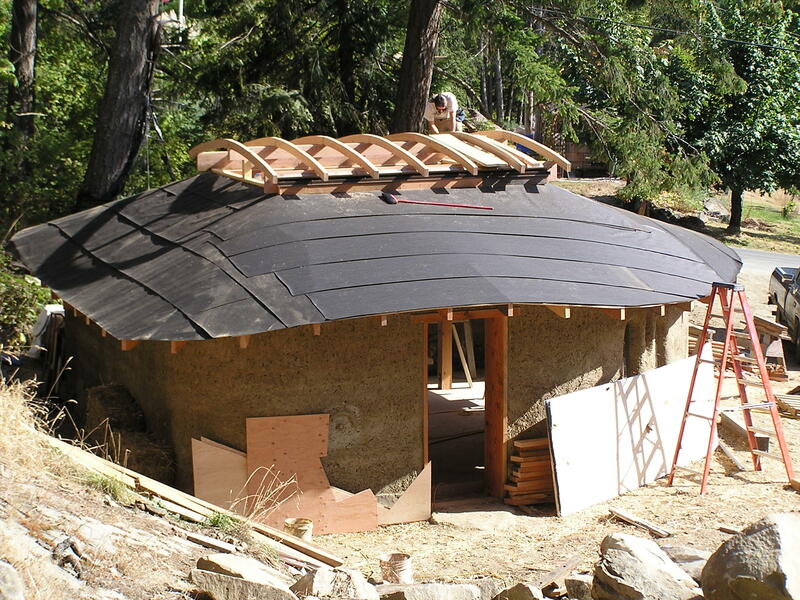 At the very end of the project Colin ran out of suitable cedar to split for final part of the roof, and not wanting to waste anymore time as it was the middle of winter, we gave in and purchased the last few bundles of shakes needed to complete the roof. Although a bit of a disappointment for Colin, this is the reality of building yourself, sometimes you just need to compromise and get it done! 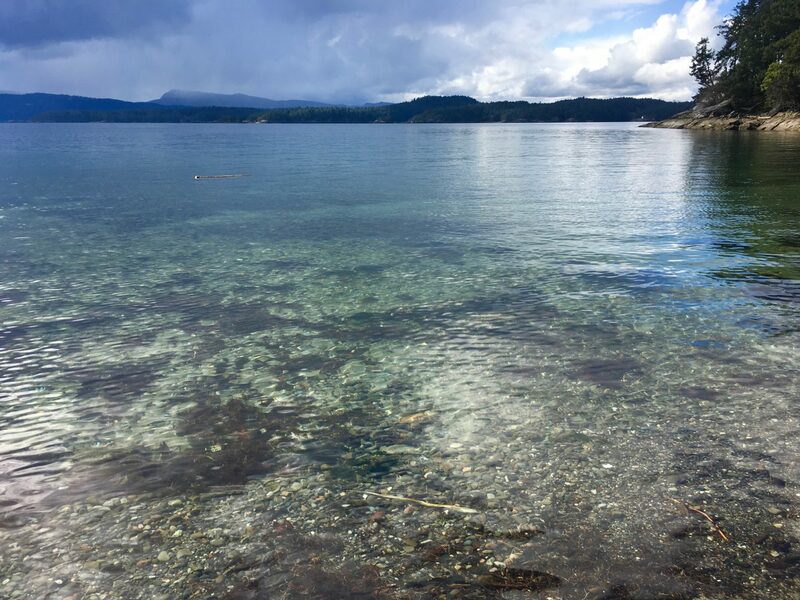 As we move into the first week of October, it remains the driest summer on record here on our west coast island, parching the gardens, drying up wells, and raising the fire danger all around us. 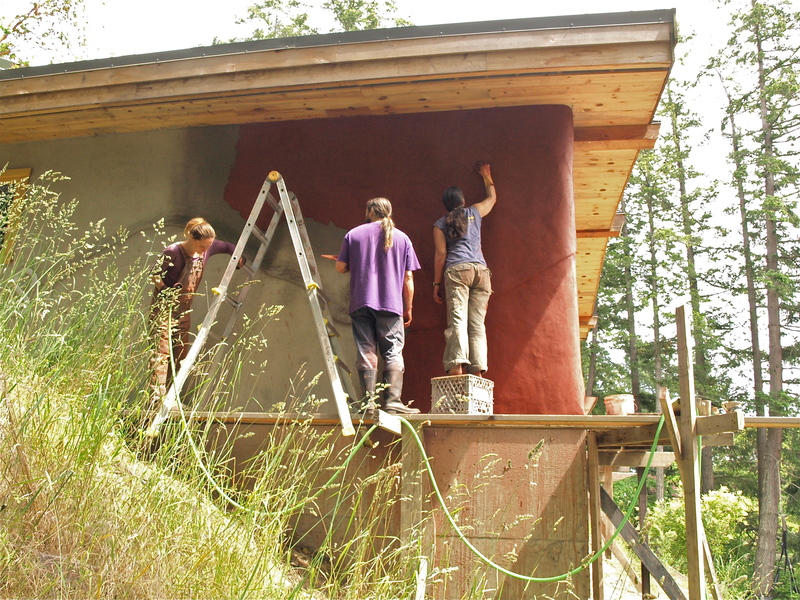 The one thing that the clear sunny skies have been perfect for is drying out the cob walls of Colin’s workshop and giving us lots of time to get the roof on and the walls protected for when the rains finally do pour down. 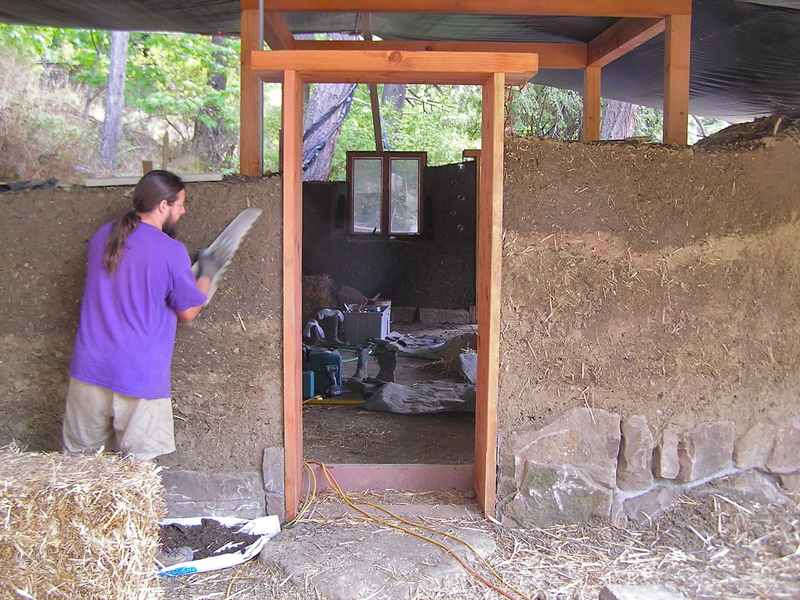 In the meantime, Colin is splitting all the cedar shakes that he needs for finishing the roof, and I am getting ready to start troweling on the scratch coat of earthen plaster on the walls. 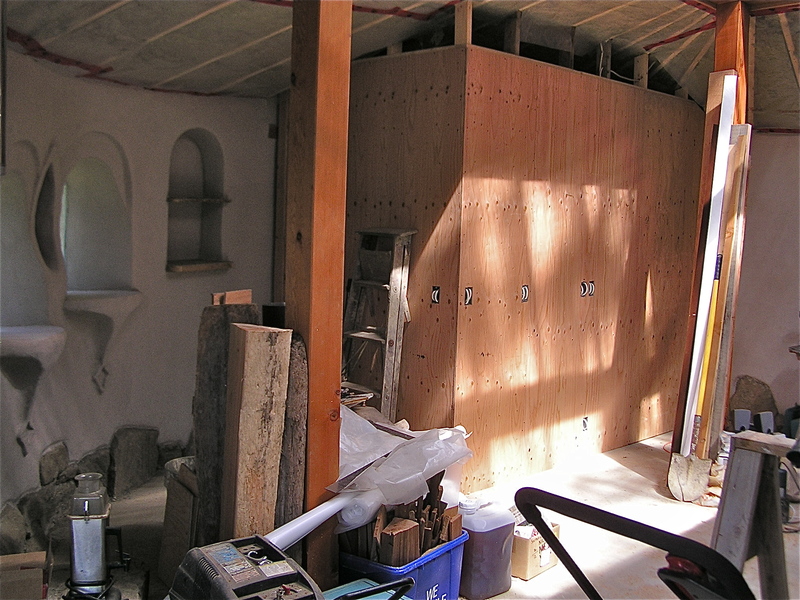 The construction of the roof began with the laying of the rafters onto the top of the cob walls, radiating outwards from the central post and beam structure that stands in the center of the workshop to support the large skylight. 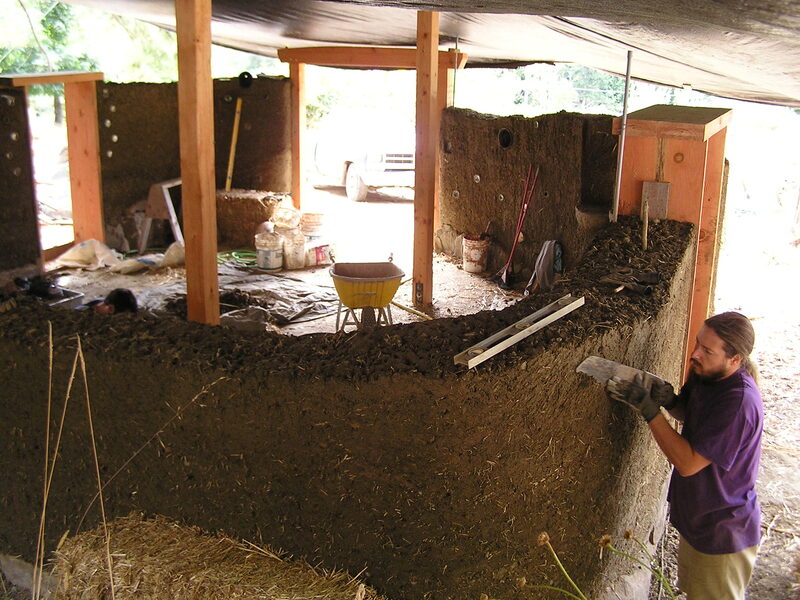 We embedded “deadmen” (inverted wood T’s) into the top foot of the cob walls every two feet, and attached the rafters to these for extra tie down support. Then we had a small amount of cobbing left to do- filling in around the rafters up to a finished height that closed in a small vent on the outside edge. 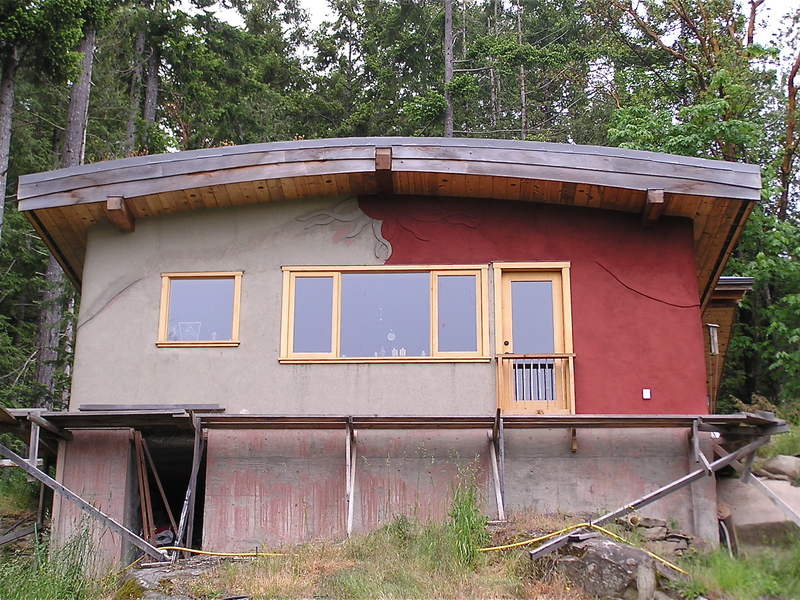 Colin had in mind an undulating roof line as well as a curving roof line, so the top height of the walls swept up and down as they went around in the circle, making the rafters swoop above doorways and dip into corners. Placing plywood over the rafters required half inch as well as quarter inch plywood, doubling up the quarter inch in the places where it needed to bend around corners and into the dips, giving the roof a plywood patchwork look. 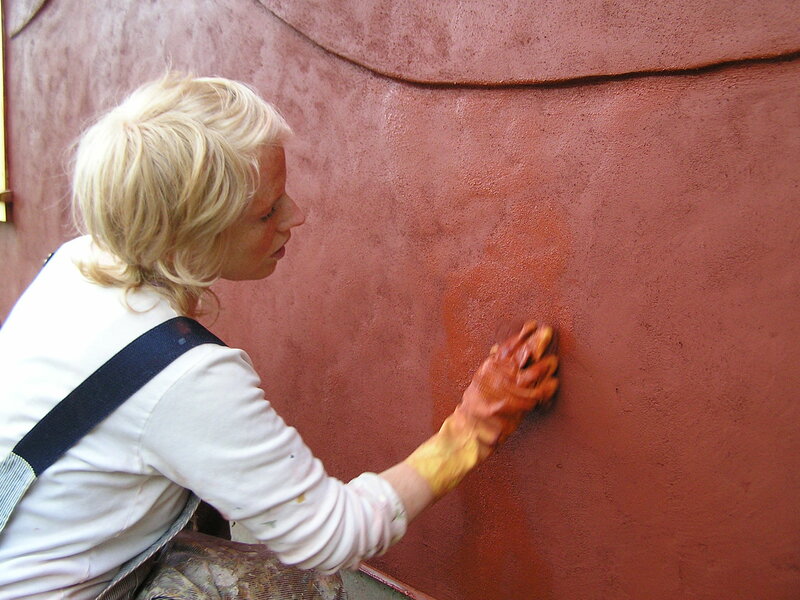 We then rolled out lengths of roofing felt and started on the skylight. 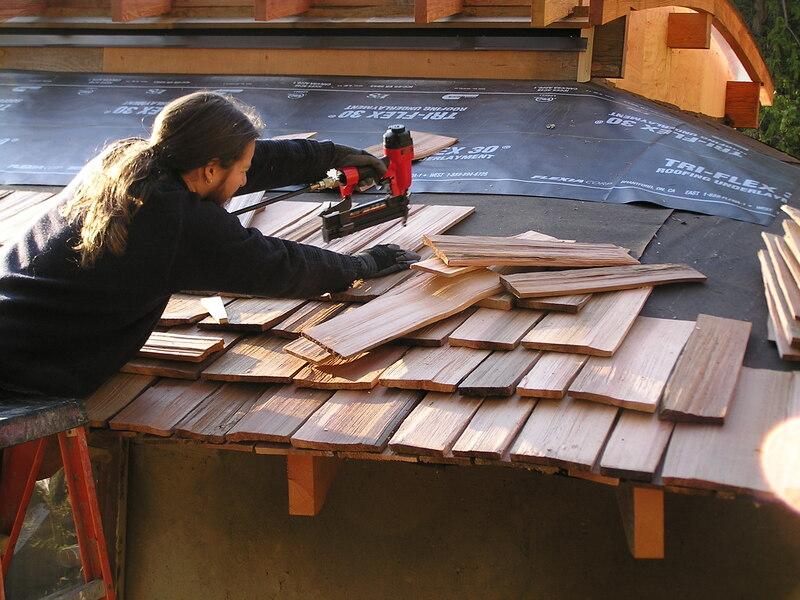 Traditionally, cedar shake roofs don’t need any plywood or roofing felt. The shakes were just nailed right to strapping over the rafters. 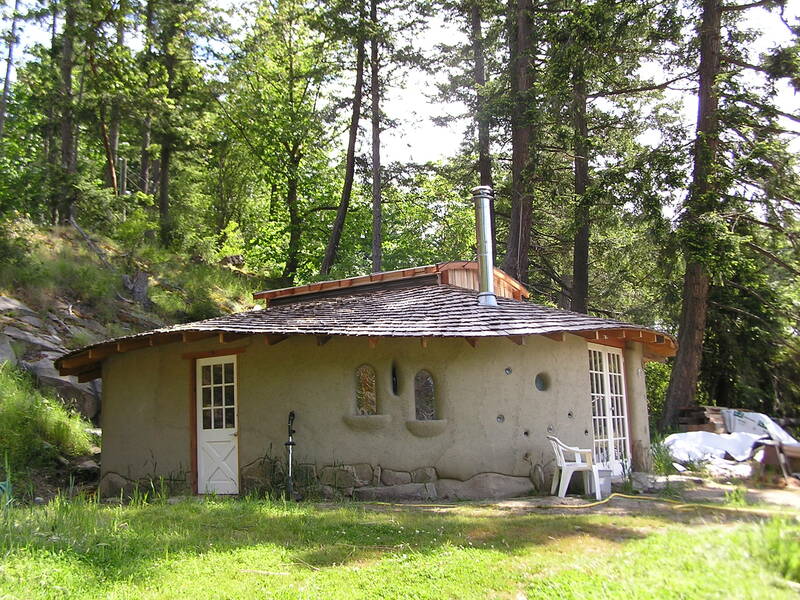 Because we are building a permitted building with unconventional materials with approval from an engineer in a seismically sensitive zone, well, we had to do it. Our engineer told us that the plywood helps to distribute the load of the roof on the load bearing walls, uniting the roof and reducing the amount of pressure directly on the walls. The skylight required a little more finessing in terms of design. 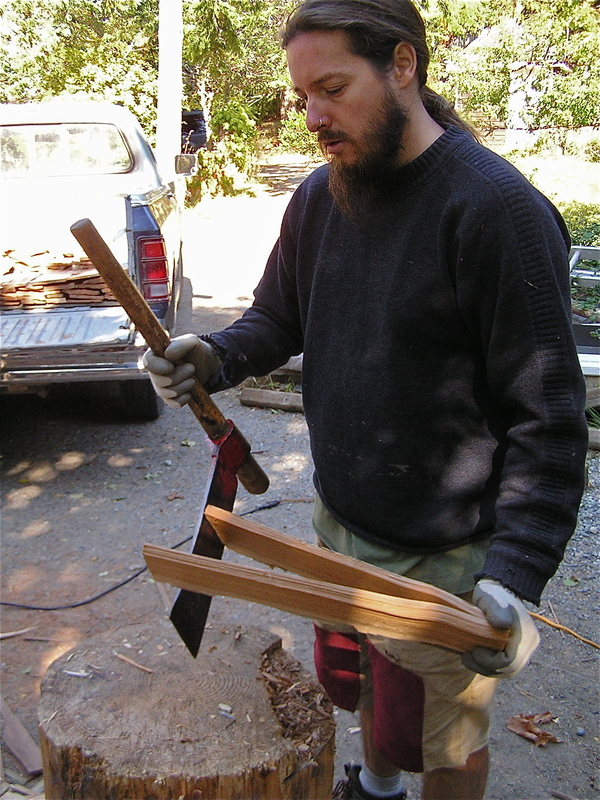 Basically, a system of nine ribs curve over a center beam, with double walled polycarbonate sheets bent over the ribs, and cedar strips screwed down on the top. Lots of details in between, of course, but that is the basic construction of the 8×12 skylight. 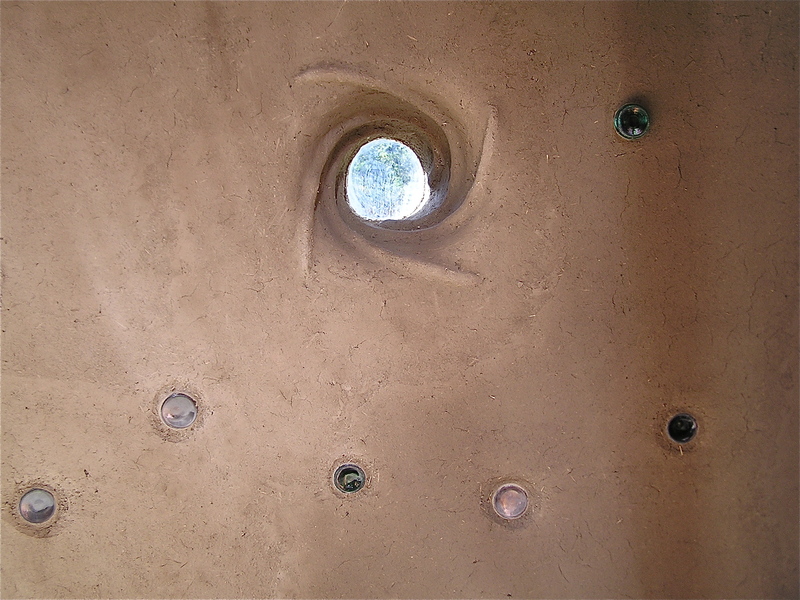 There is plywood filling in the ends of the skylight, and roof venting along the sides that moves the air through from the vents at the other ends of the rafters. We will be filling the inside of the ceiling with rock wool insulation, leaving a two inch gap at the top of the rafters for this passage of air. 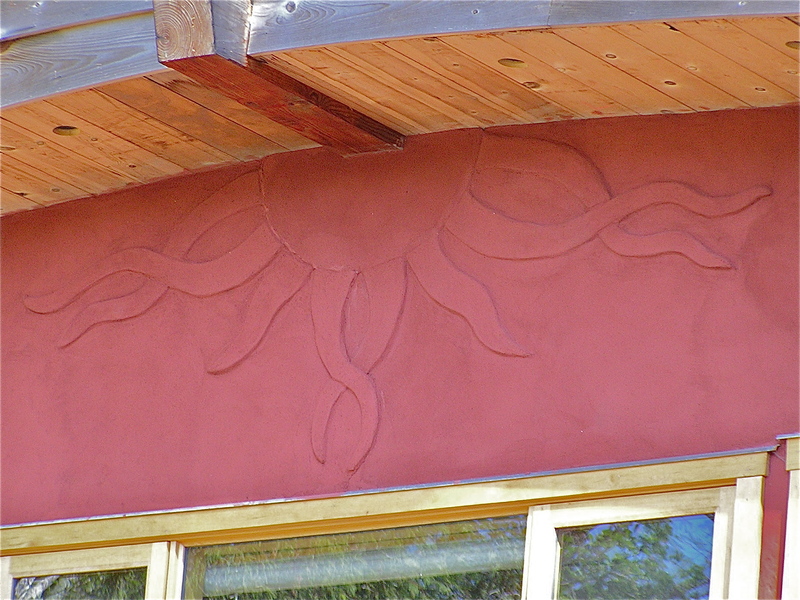 The light inside is a beautiful diffused brightness, and the gentle curves and waves of the roof line is complemented by the surrounding slope and roll of the bedrock, the arch of the lifted skylight echoes the balanced curve of the strawbale house above it. The moments of standing and looking at the very real outcome of what was an imagining is almost surreal, as if we were imagining what was already there and had just failed to notice it before. 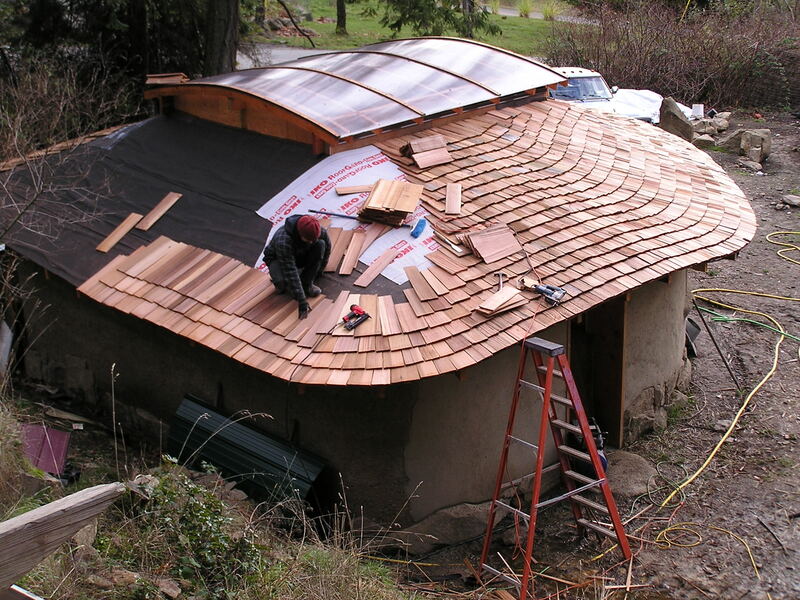 We still have an extensive list of big and small jobs to do before the workshop is usable, or finished, but having the foundation up to the roof constructed and becoming a part of our landscape is an amazing accomplishment. Thanks to many helping hands, encouraging words, and loads of summer fruit dropped off by generous neighbors! 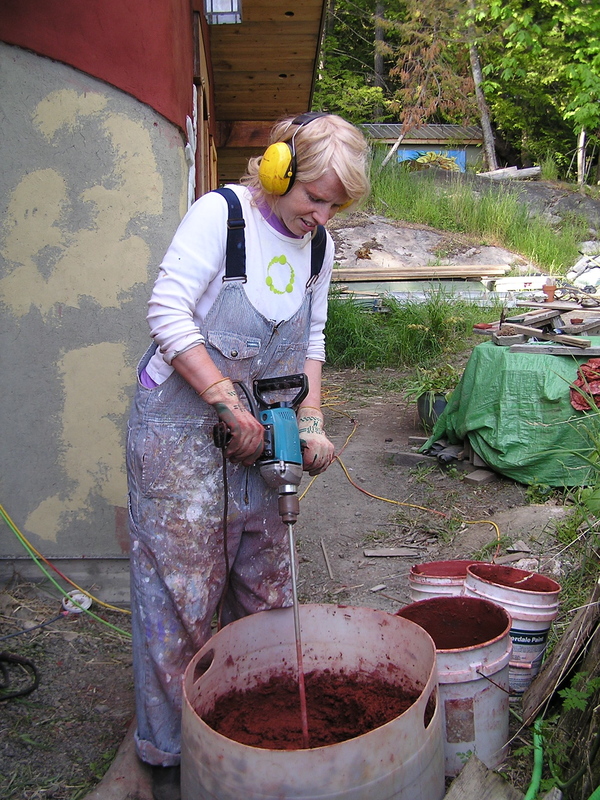 It has been a little difficult to keep up on a blog posting about the building of the walls, because so much is happening in such a short time that photos of progress quickly become out dated. Most of my own time has been spent working alongside the cobbers, helping my mom to prepare and make meals, or collapsing in bed at the end of the day. The walls are now very close to their final height, and we will soon be able to install the rafters before we continue with the cobbing up and around them. 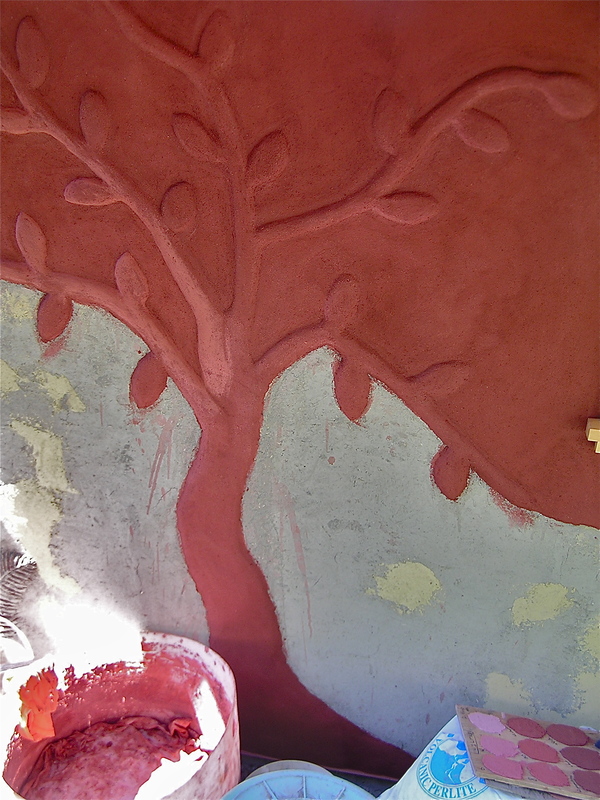 I thought it would be a good time to review what has been done, and then follow up with the roofing later on. 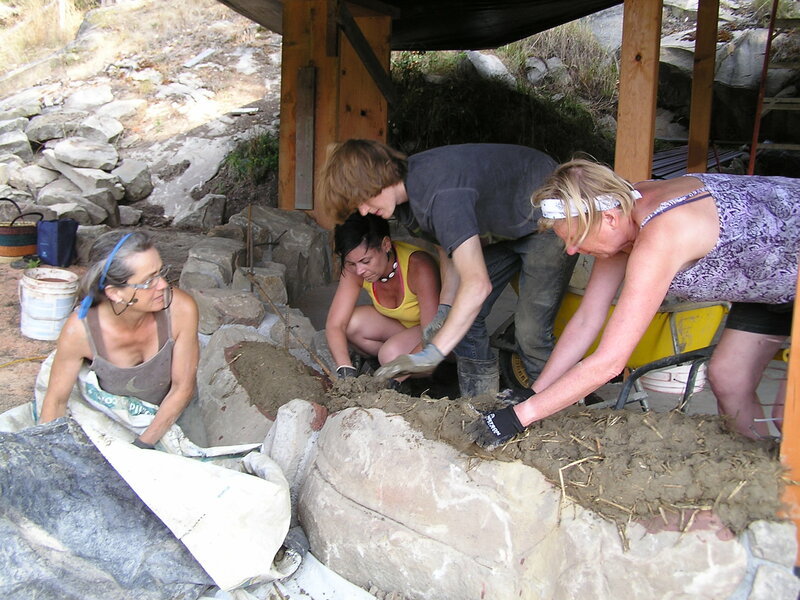 We had three people from off-island join us for four days, and a continuous stream of friends and neighbors each day to learn and help out. Colin’s mom from Florida was visiting, as well as our friends from Vancouver who sold us the property and are building the little cabin on the property. 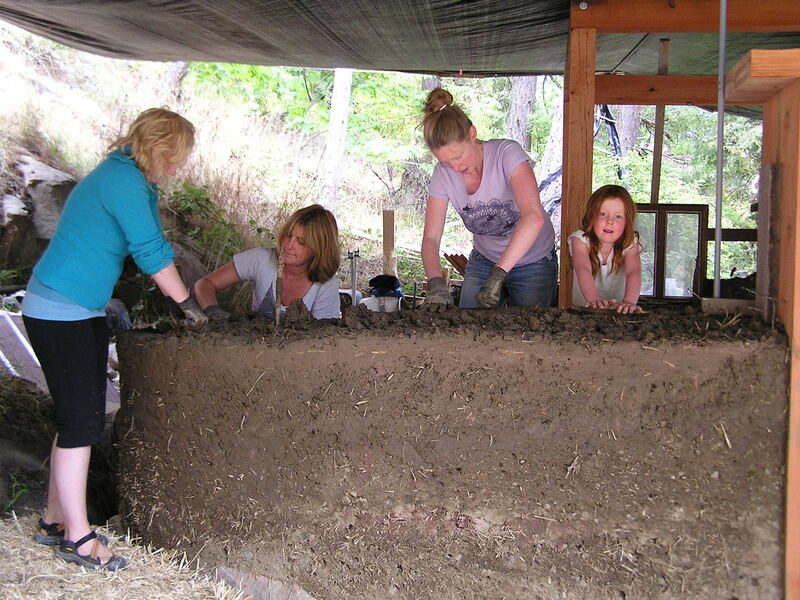 We started with learning the art of foot mixing on tarps, but then moved on to using the huge pile of bobcat mixed cob. 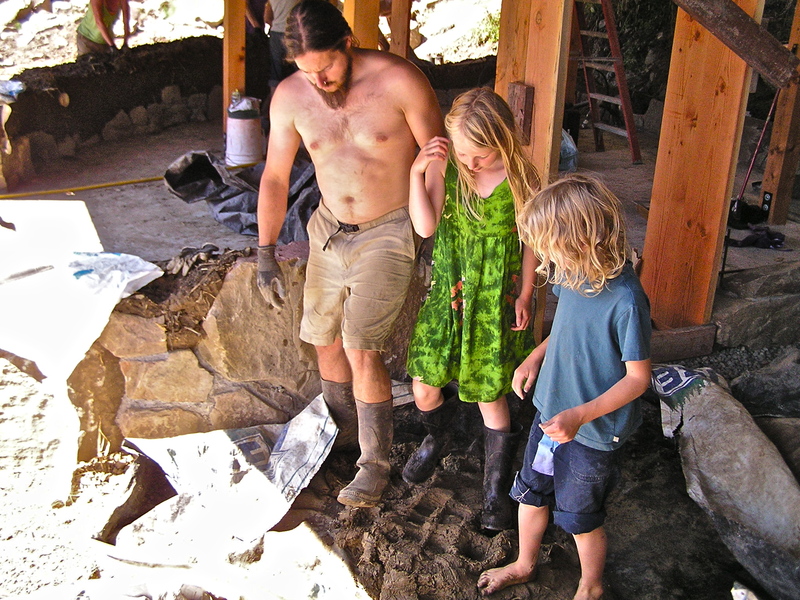 Tracy Calvert, our cob building expert from Cobworks, showed us how to apply clay slip to the stones of the foundation to help adhere the cob to the stone, and then we started laying down the first handfuls of cob. 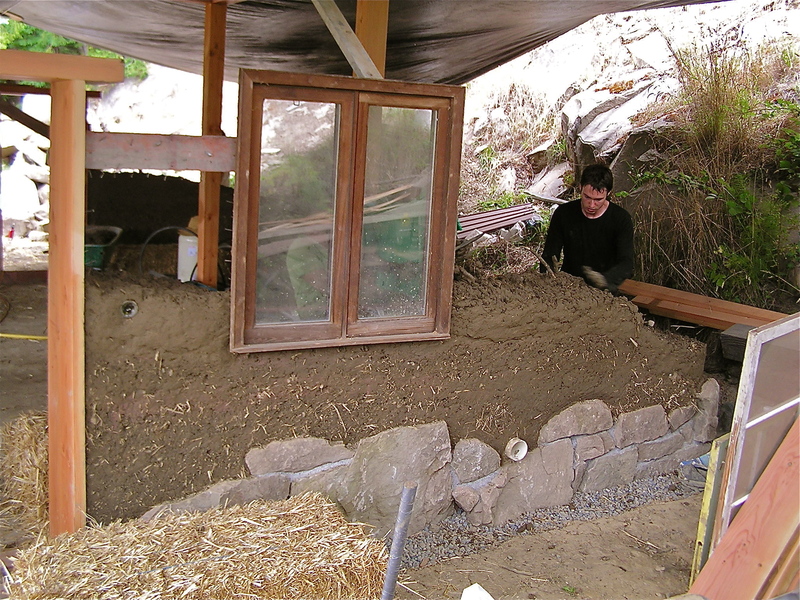 We focused on building up one of the wall sections that would have windows in it, so that within the four days, our cobbers would have the opportunity to set the glass in place and cob the sills and edges. Tracy spent time each day after lunch discussing different areas of the building process, including foundations, techniques for windows and doors, plumbing and electrical, and roof structures. On the last day, we had a small ceremony to celebrate our work together by placing objects in a jar that have a personal connection and burying it into the wall of the workshop. We did that again with the second group of cobbers on the next weekend, and Colin and I were very touched at the honesty and words of appreciation and inspiration that everyone had regarding their experience building and learning together. 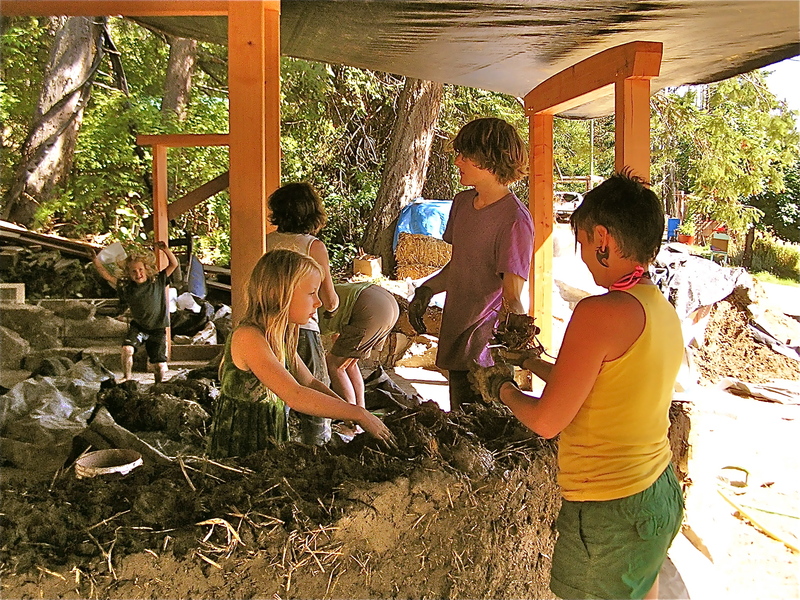 Everyone had a different reason for being here learning about cob- some of which were specific to cob and some were seeking personal empowerment. We come together as strangers and leave each other with new friendships and new gems of knowledge to integrate into our lives. I was reminded of the time when Colin and I traveled a lot and met different people from all sorts of paths, knowing them sometimes for a short time or a long time before parting ways, but always taking something of the experience of knowing them with me. It is also wonderful to have friends and fellow islanders stop in for a day or more to help out. Having the support of our community means a lot to us. We have come to see the building of this workshop as another example of building stronger community ties with experiences of working together and deepening relationships and memories between us. 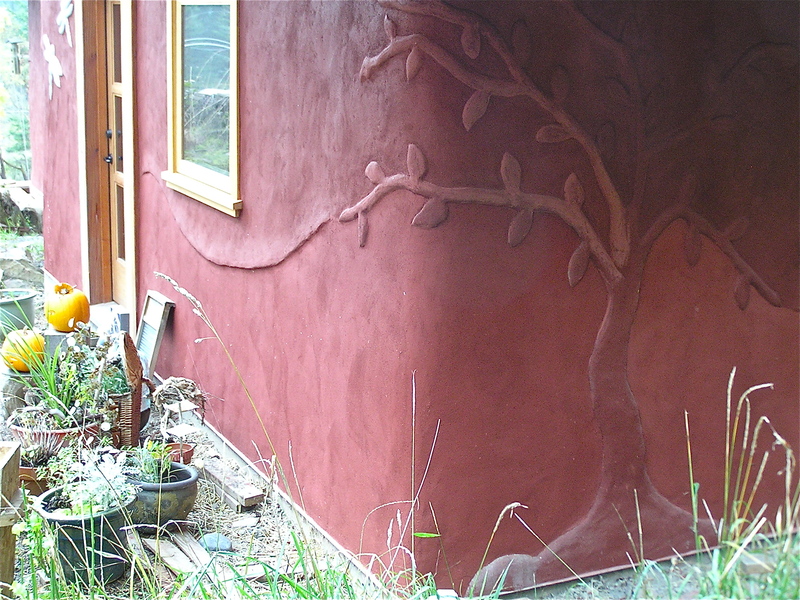 Colin and I had drawn out a general sketch for a sculptural design on the outside of two flowing lines coming out from the sides of the main door and sweeping up into a raven on the left, and diving down into the roots of a tree on the right side of the door. We wanted to have bottles placed in the wall along the pathways of the two lines, so as we went we taped two bottles together to span the width of the wall and cobbed them in place. 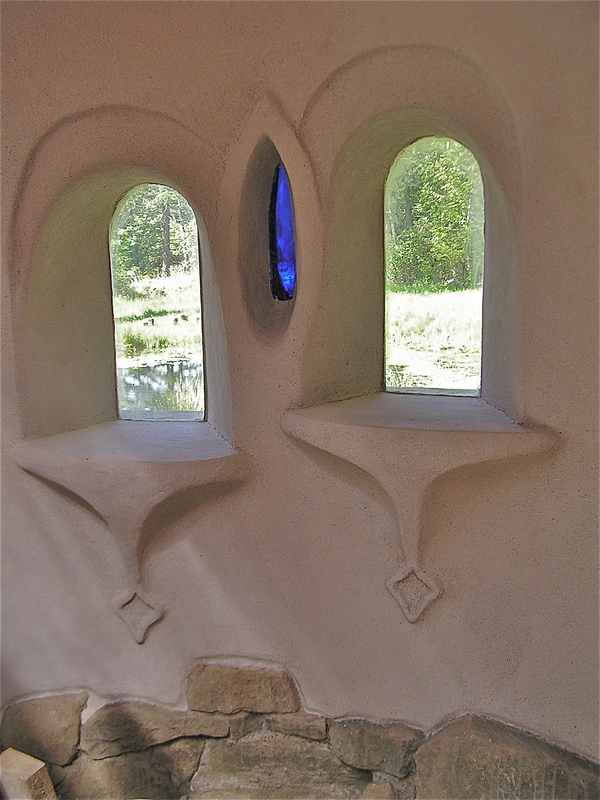 We also have some circular thick glass port windows, about 8 inches across, that we wanted to have in the walls, so we put buckets that were slightly smaller than the glass in the place where we wanted the windows and them cobbed all around them. By turning the buckets each day we ensured that they will pull out easily when we want to set the glass in. 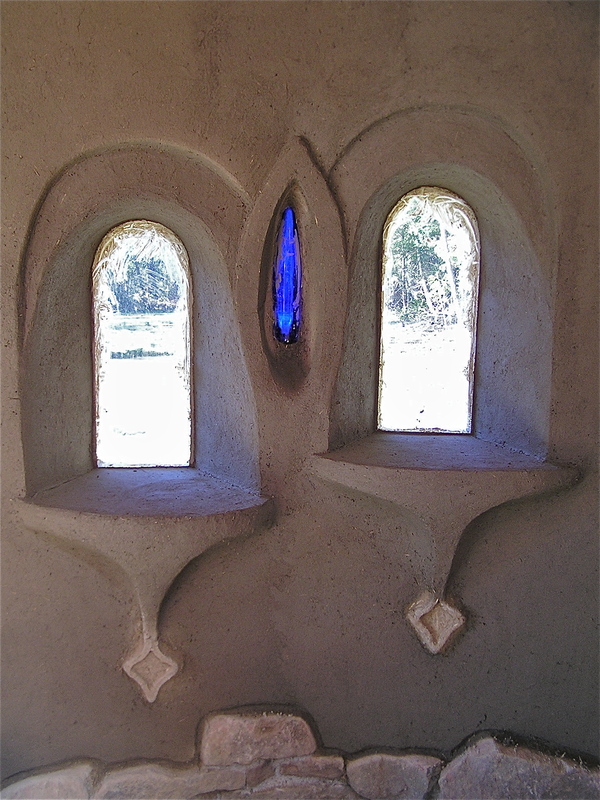 We also made corbels with long lengths of straw covered in clay and layered together to build a strong protruding window sill and arches over the tops of the tall windows that we cobbed in place. Celine, our neighbor, brought us a beautiful tall blue glass bottle that we placed in between the windows, adding more dimensions to the width of the wall. 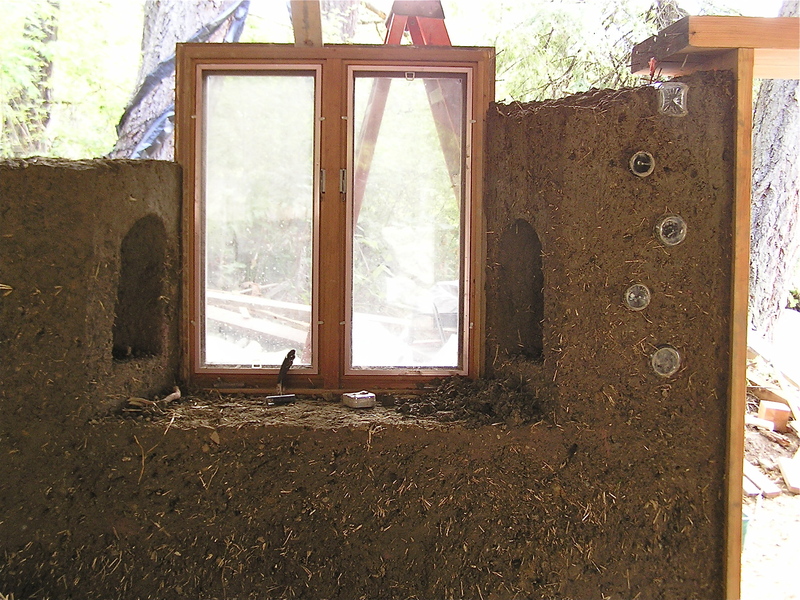 We added a framed opening window on the east side, hammering old nails into the wooden frame for the cob around it to grab onto. 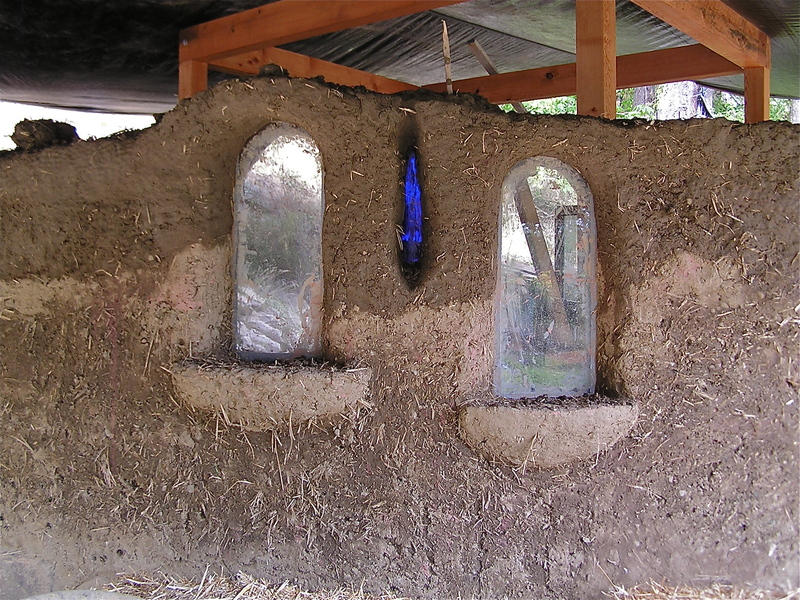 We did the same with the door bucks, creating a network of wire and nails that the cob will harden around. There is no plumbing in the workshop, but there are a few light switches that Colin mounted near the door bucks, running an electrical conduit up to the rafters where all the wiring will run. Other electrical outputs will be built into an interior wall that will frame in a utility room and backing for Colin’s work bench. 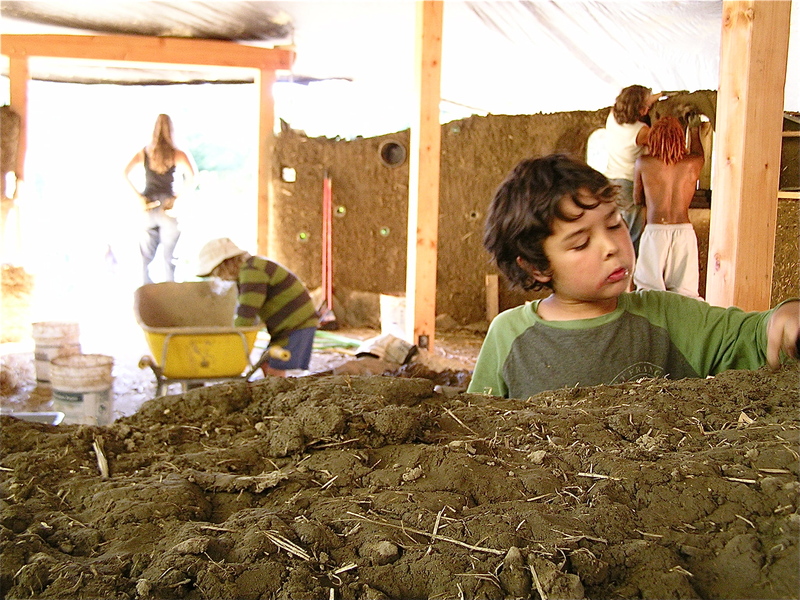 Trimming is a big part of cobbing. 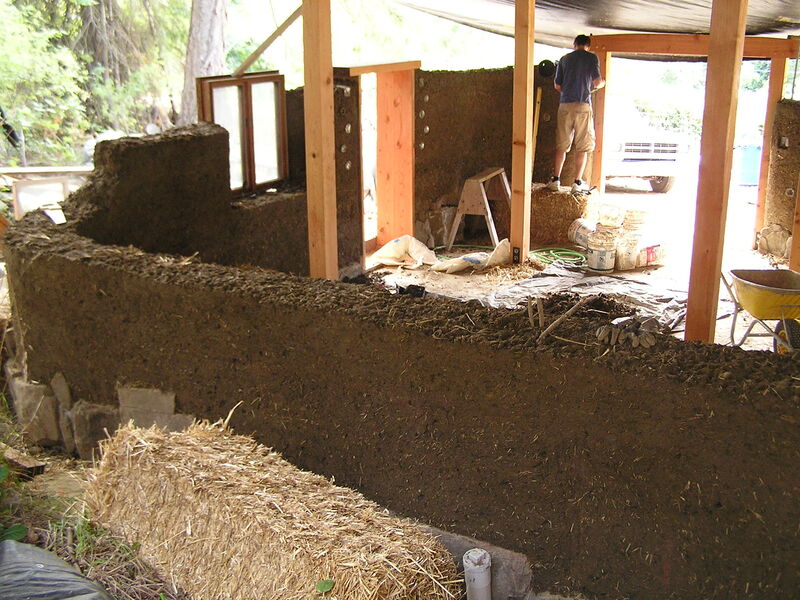 Every day, before more cob is loaded on to the walls, the splooges that occur while building up with wet cob is trimmed off with a saw and remixed to be put back on the wall. 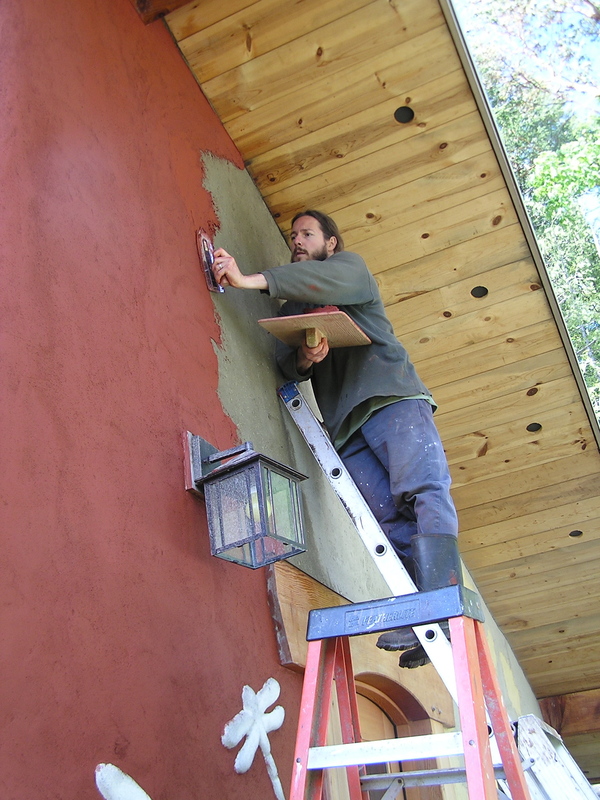 It is important to make sure that the walls remain plumb, so that the strength of the weight of the cob is kept directly above the foundation. 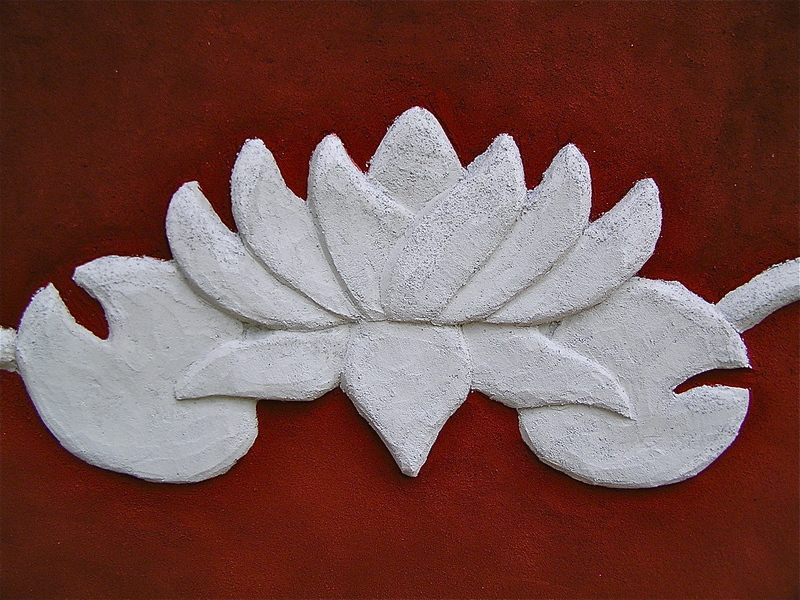 It is easy for the wall edges to wander in all directions. 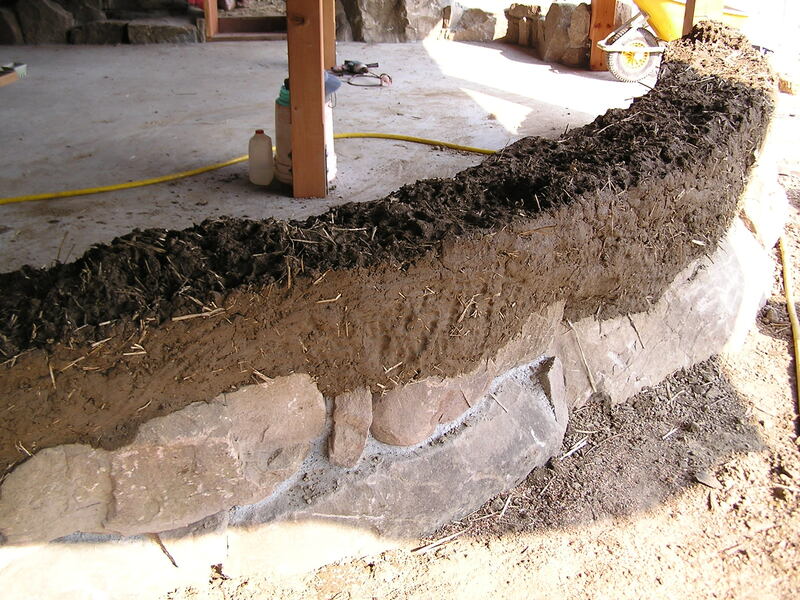 It is also easier to trim excess splooging than it is to add to dips that may occur, so it is important to keep the edges as plumb as possible and allow the splooging to happen. 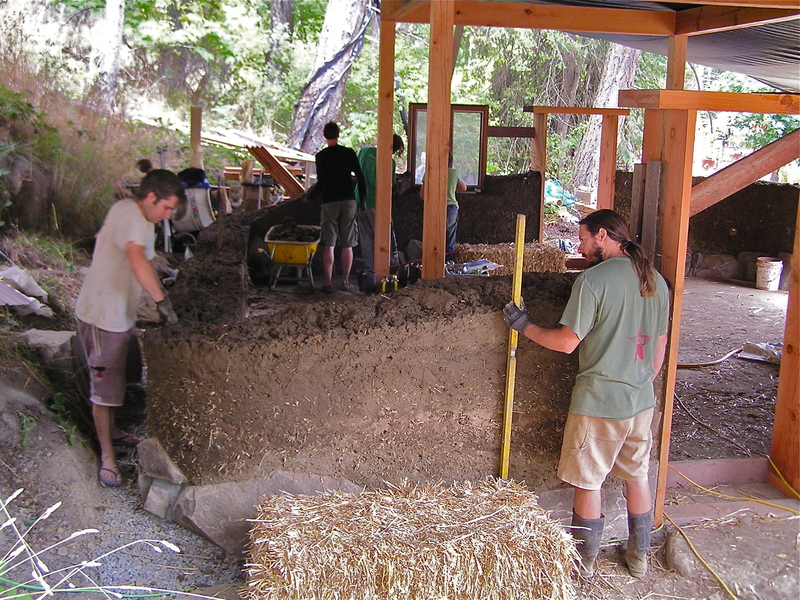 We had the bobcat return in the days between the first weekend of cobbing and the second, to mix more cob and to remix the leftovers as it was getting dried out. We had two cobbers from off island join us for the second workshop, and again a continuous flow of islanders coming by and spending time working with us. By this time, we were also getting two or three groups of people stopping by every day just to see what was going on, asking questions and watching the process. We are fairly visible to the road, so walkers would stop, cars would slow down, and our neighbor across the street sent anybody who came to see her and her road side stand over to check out our building. After the weekend, Shawn (one of the workshop participants) decided to stay an extra three days and keep cobbing before flying back to South Korea, and we had two more people arriving after that who were not able to make the workshop dates but wanted to learn while we were still getting it finished up. 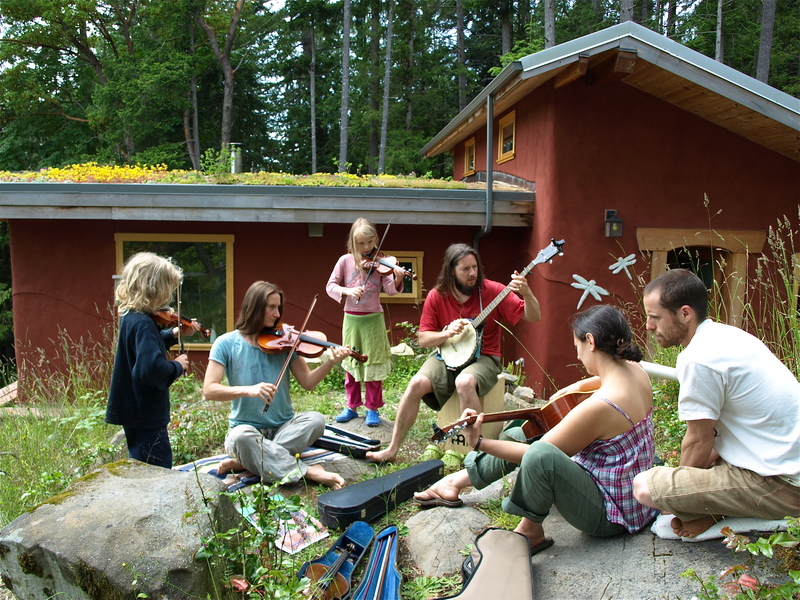 That is where we are now- working up in the top few feet, making deadmen for the rafters to sit on, feeding Marco and Nick alongside our family, and enjoying the continued company of our community. 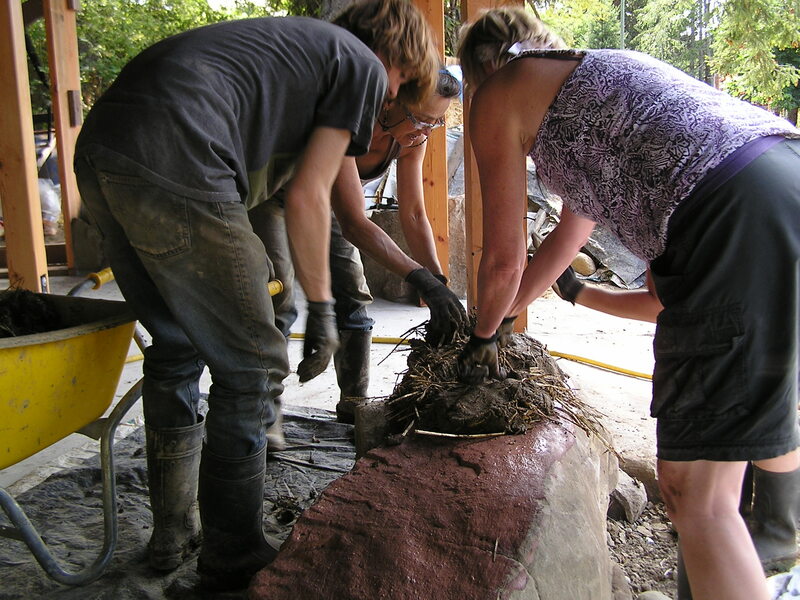 Cobbing so far has proved to be a lot of physical work, work that is energizing and fun with a group of people working together and learning from each other. 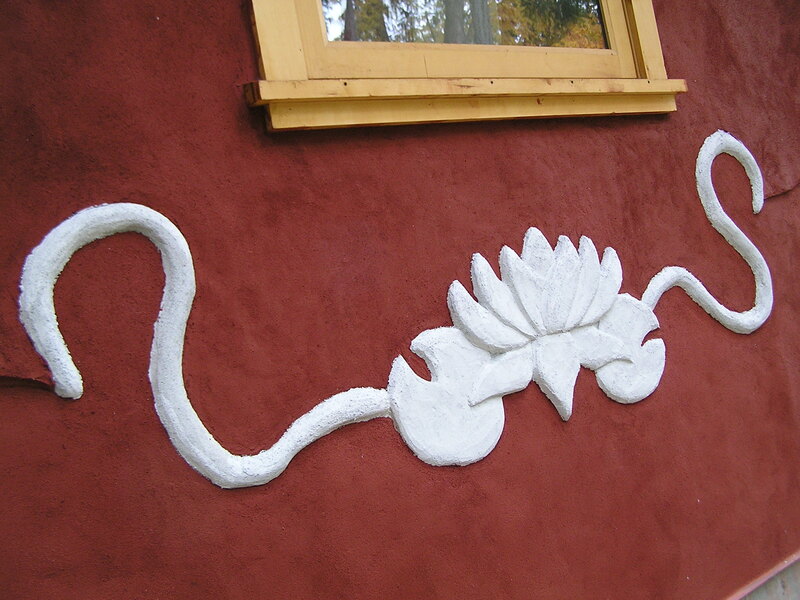 New creative methods of building are developed, and artistic touches are discovered. 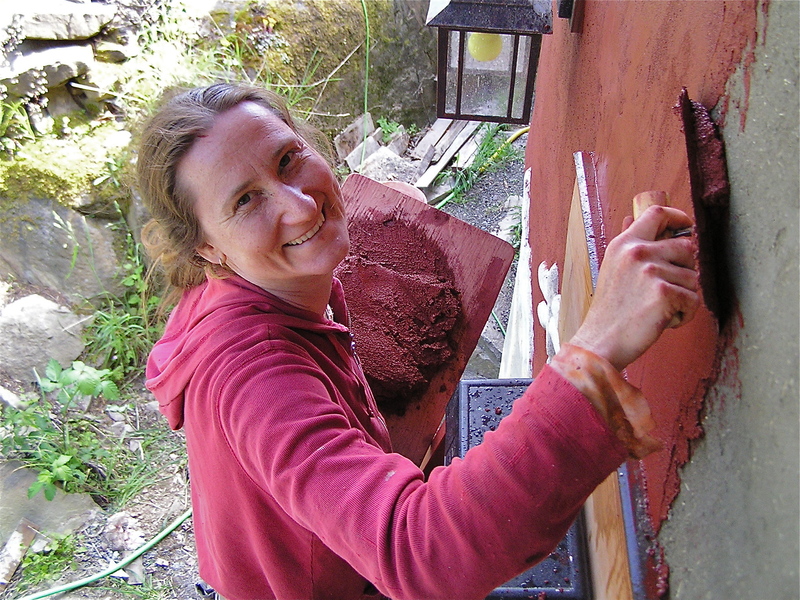 It would be too lengthy for me to explain details of the cobbing techniques, so I will recommend a book that Tracy recommends for anyone interested in learning more. 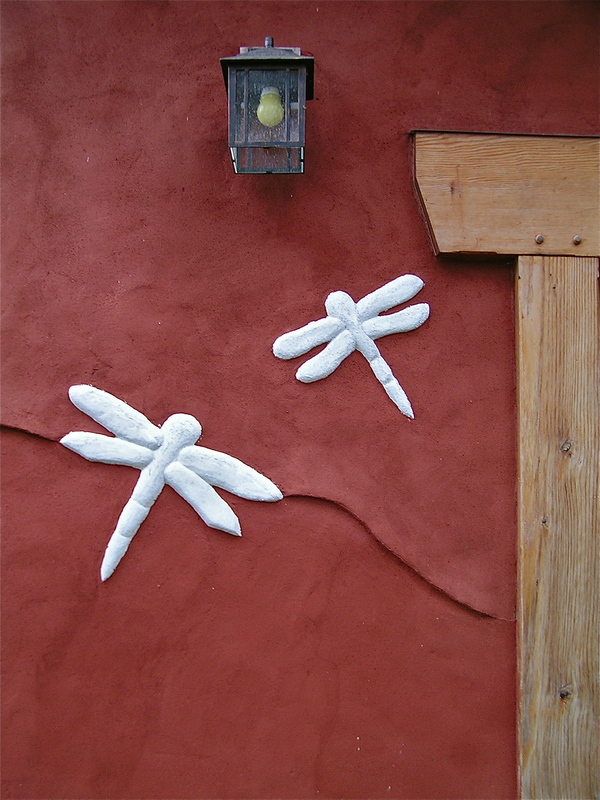 Check out The Hand Sculpted House, by Ianto Evans, Michael Smith and Linda Smiley and Cob Cottage Company in Oregon. 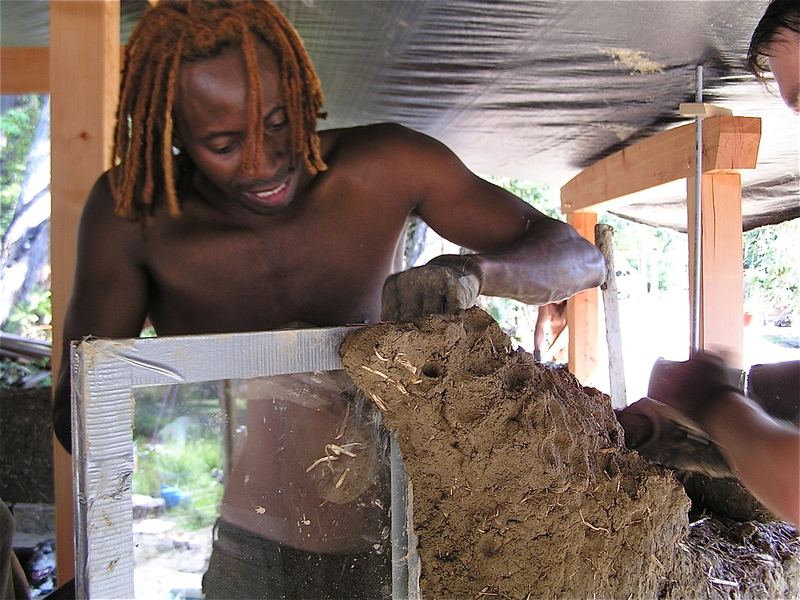 I also recommend a hands on experience for a better understanding of the process, and as a way of feeling out whether cob would be the ideal method if you have a project in mind.